The remarkable image of a dangling campervan in Colorado is from a story via DailyMail.co.uk. With a 170ft drop below, Daniel Lyons could have done with knowing what Michael Caine's brainwave was at the end of The Italian Job which has a similar scene as its climax. Nonetheless the 34-year-old was saved by rescuers in Colorado in the U.S. after he had careered down the rock face in the Dodge camper van. Terrified, he'd desperately tried to balance the weight of the van to prevent him from plunging to his death. 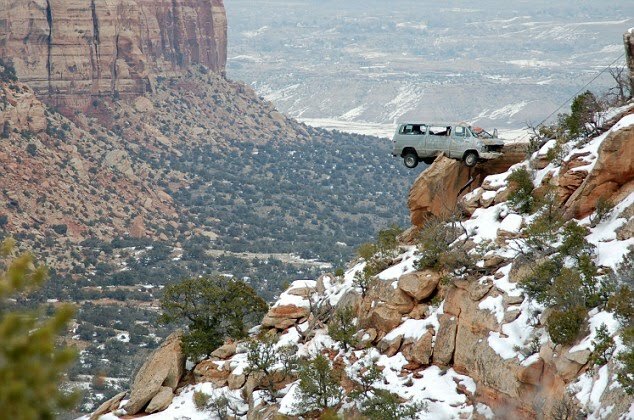 But in his confusion he climbed in the back - which was already hanging off the cliff - exaggerating the balance of the vehicle. As a result, rescue crews who raced to the scene of the accident found Daniel cowering in the swaying vehicle. They managed to manoeuvre him from the van and up the cliff face before he was airlifted to hospital where he was treated for minor injuries.